In the summer of 2002, Chris Hrabalek, an Austrian automotive designer, sees a Ferrari Dino 246GT stranded on a Spanish road close to Sitges. Hoping to lend a hand, Hrabalek gets out and introduces himself to the driver, German Michael Stoschek. They start working on the Dino. They get to talking. It turns out that the men share something beyond the breakdown lane on the road to Sitges: namely, a passion for the Lancia Stratos HF rally car of the ’70s. The two keep in touch. Hrabalek sends Stoschek the sketches of a modern Stratos interpretation he’s been working on. Stoschek, CEO and owner of the successful German automotive supplier Brose, and a passionate driver of historic rally cars, begins to dream. This is what is known as serendipity. Originally, the latest model of Lancia Stratos was not designed for regular cars, but is designed as the car racing. 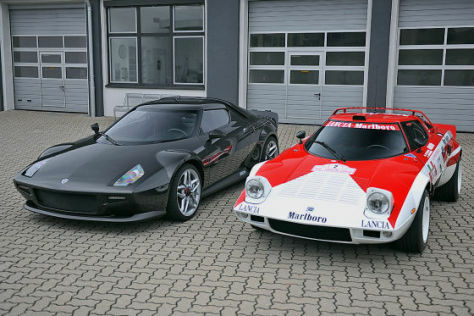 Thus the Lancia Stratos has a unique impression for potential buyers. The unique impression lies in the design and construction process. The uniqueness of Stratos construction process, the usual process of collaboration racing car created by making an ordinary car models first, but on the contrary Lancia Stratos. With the construction process flow, then we can see there are some things physically unique. The New Stratos uses the Ferrari Scuderia’s 4.3-liter V-8. It is mounted on a steel subframe and built into a shortened version of the Scuderia’s aluminum chassis. Pininfarina took out 7.9 inches just ahead of the B-pillars and added a stout, 121-pound steel-tube roll cage. 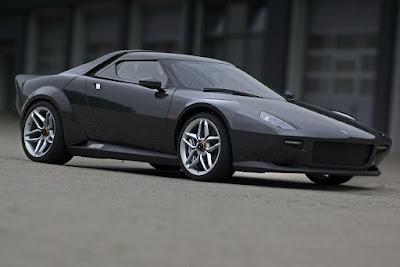 The wheelbase shrunk to 94.5 inches; the New Stratos checks in at 77.6 inches wide, 48.8 inches high, and just 164.6 inches in overall length. All exterior body parts (and most of the interior bits) are carbon fiber, as keeping mass in check was a priority. In total, Pininfarina managed to shave 176 pounds from the Scuderia, despite the addition of the roll cage. An example: The 9.3-pound battery is a lithium-ion unit housed inside a carbon-fiber box. And here is the main difference between the Stratos and the heavier Scuderia: To cut 176 pounds and to help the car leap out of corners, Pininfarina’s prototype workshop replaced the active Ferrari E-Diff with a sharper-reacting, lightweight Drexler limited-slip differential that sends a wallop of torque to both rear wheels.